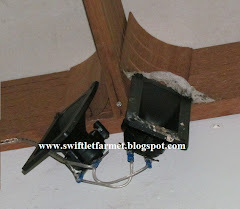 Some of my students have asked whether installing CCTVs in Swiftlets Farm would do harm to the Swiftlets. 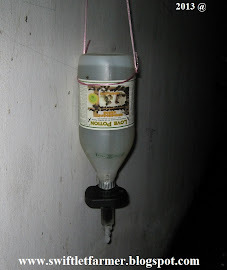 The reason CCTV is installed in Swiftlets Farm is to observe the moments and the activities of Swiftlets in the farm. 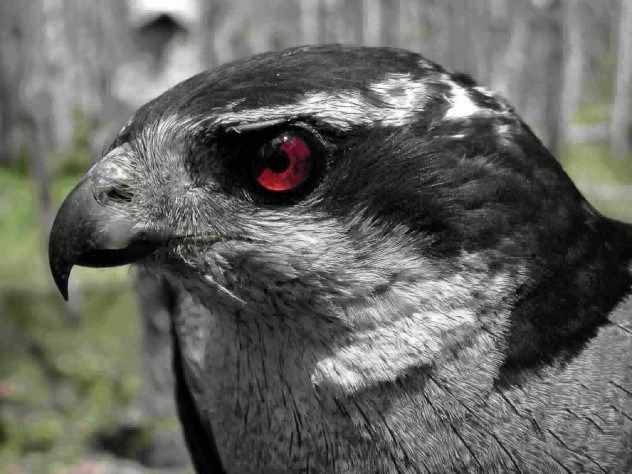 From the CCTVs we could observe and study how many birds actually stayed, how they entered the farm, any predators entered and also intruders like thieves, etc. 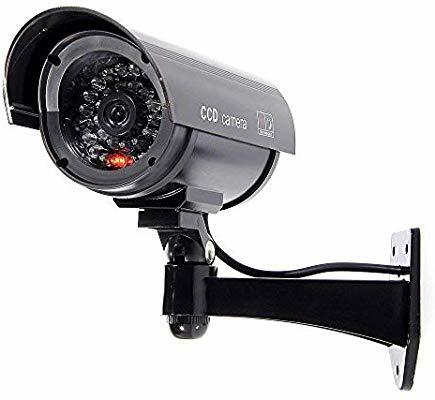 There are many CCTVs in the market today. As we know the internal environment of a Swiftlet farm is always dark, so choosing the right CCTV is utmost important. 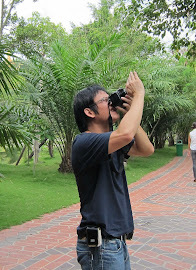 It must be able to function well in the dark enclosed areas to capture videos or images in low light condition. In order to do that the CCTV must have the IR capability (IR: Infra-Red). IR CCTV could capture high resolution pictures and videos in low light condition where as normal CCTV couldn’t do. But, there is a setback. Let me explain. Some IR capability CCTVs have Red light indicators when switched on. 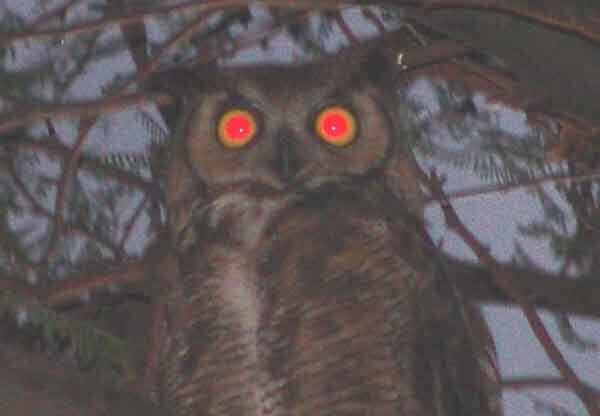 These Red light indicators resemble the eyes of predators, especially Owls and Eagles. Owls and Eagles are predators that hunt from an ambush. Often they hide at the edges inside the farms (Outside). Smart and experienced Swiftlets knew this. Any sign of the predators would deter them from staying in the farm. CCTVs are often installed at the edges of the Roving areas, Nesting areas, etc so as to cover a bigger viewing area possible. The places where the CCTVs are installed often are also the places where the Predators like to perch. One of the indications that you could observe is when the birds make a sudden turn back as they approaching the Roving area towards the second Entrance Hole. This showed that they are afraid or they had seen something which is not right. 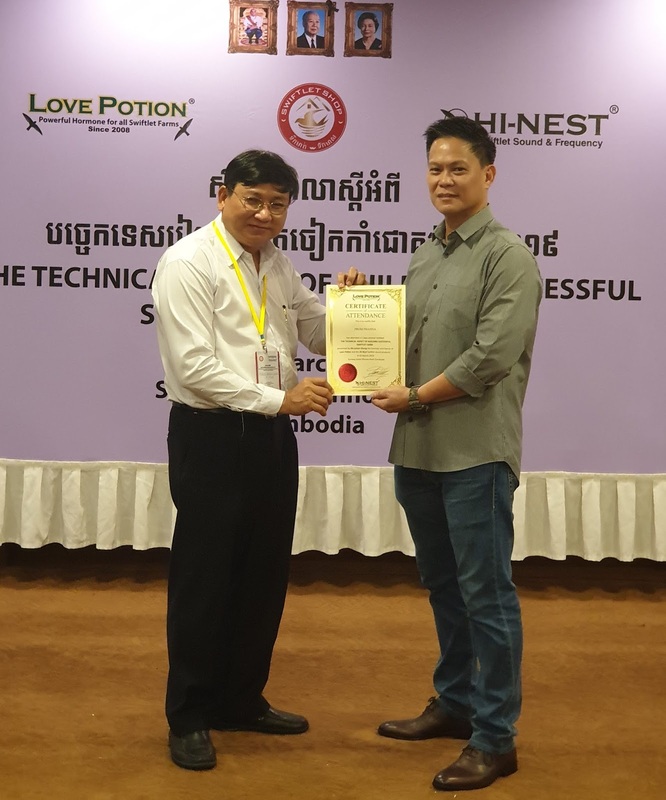 This is bad for New Swiftlets farms as it would take a very long time for birds to stay and build nests. So choosing a right CCTV to use in your Swiftlet farm is important. Find those that don’t have the Red light indicators when switch on. There are many in the market. 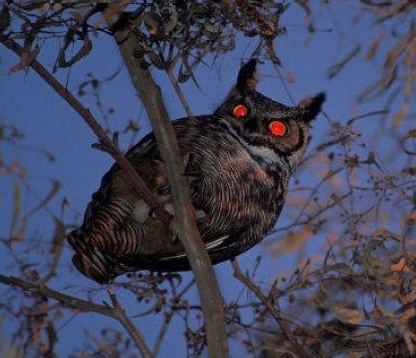 Find one that has IR capability but without the Red light mode otherwise when the birds fly in with speed you could only see nothing but a shadow. 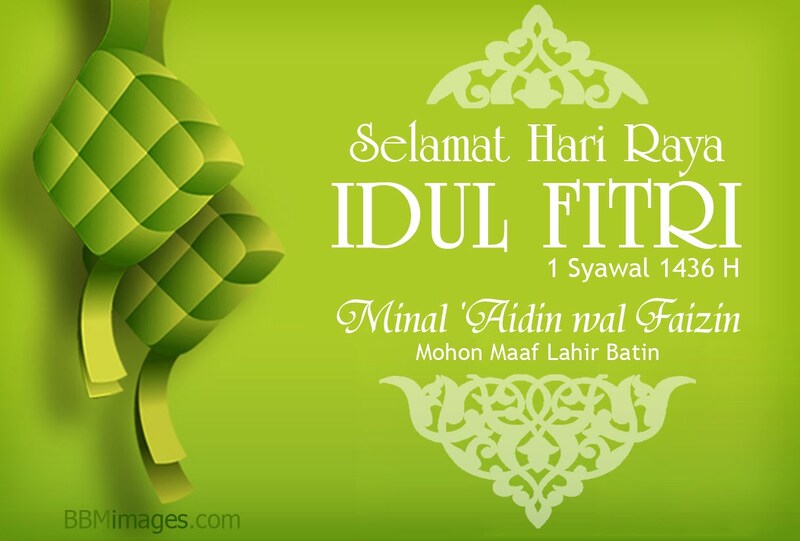 I am back to Sabah again this time to Sandakan. I was asked to help this failed Swiftlet farm which was built more than a year ago. 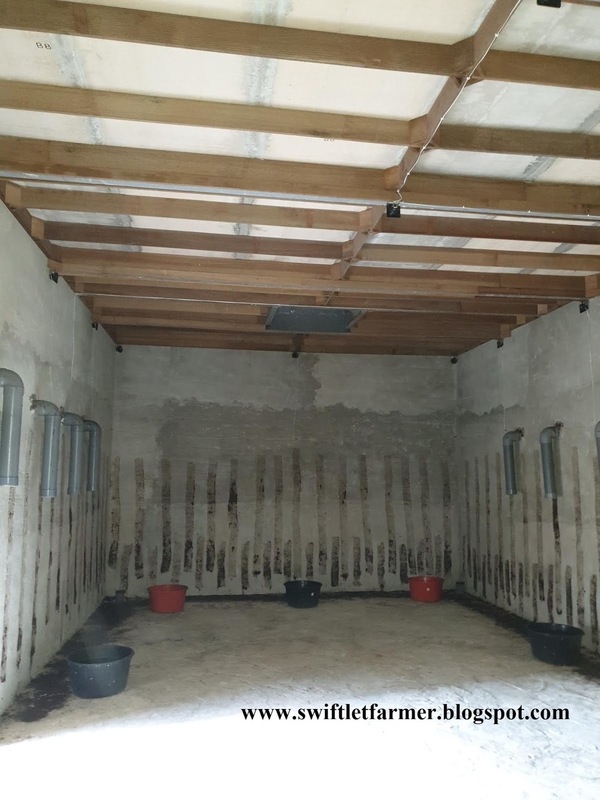 It is a single storey farm with a Dog Kennel design. 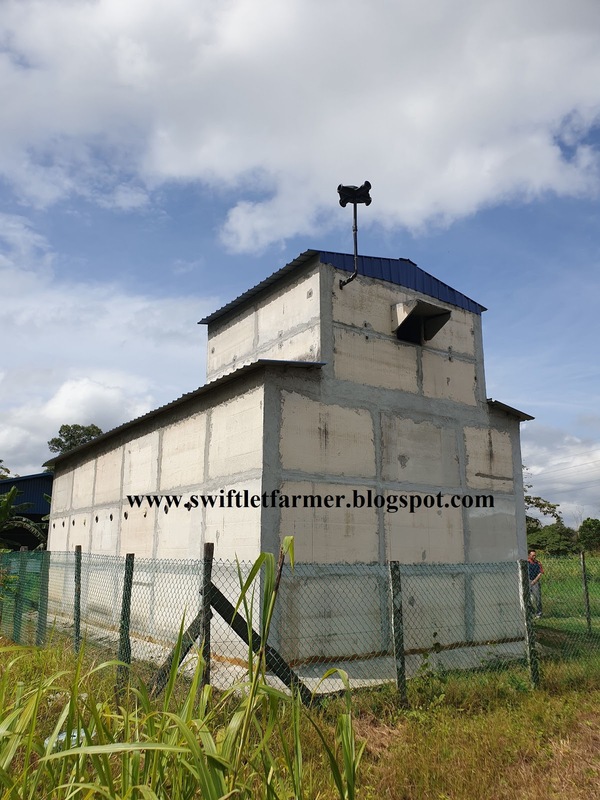 The owner had engaged a so called "expert" to build it for him as he knew very little about Swiftlet farming. After spending so much hope and effort, it has only 2 nests. To be precised 1.5 nests. Worst of all one of the nests is half completed. 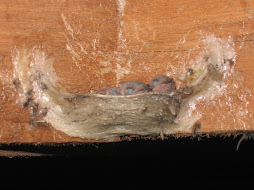 It means the Swiftlets had left after building the nest half way. The number of failed Swiftlets farm would keep increasing if the people still do not change their mind set. Sabah is one of the states that have the most failed Swiftlet farms. 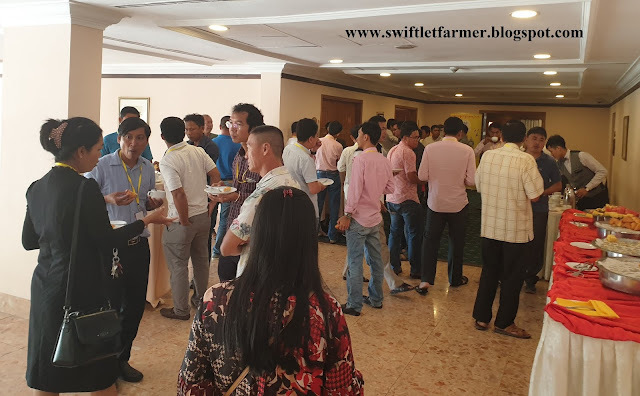 At the same time, Sabah has the highest number of Mini Swiftlets farms compared to other states. 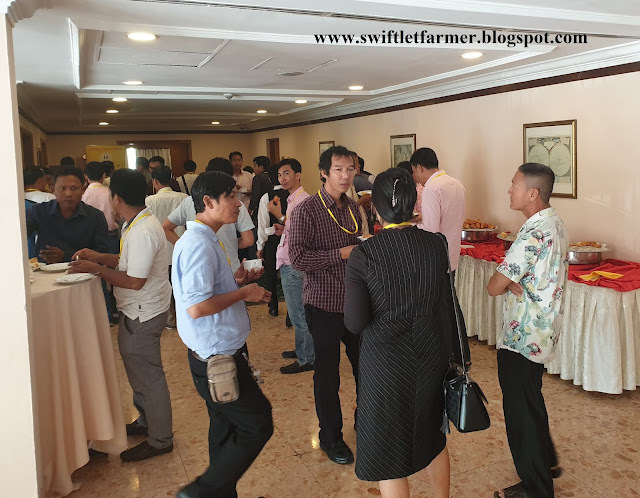 The perception of "It is so easy to build a successful Swiftlet farm” has taken Sabah by storm. "Everyone can have successful Swiftlet farm" quoted similarly to AirAsia” Everyone can fly" is totally opposite. So what if everyone could fly but they can't get to the destination they wanted? 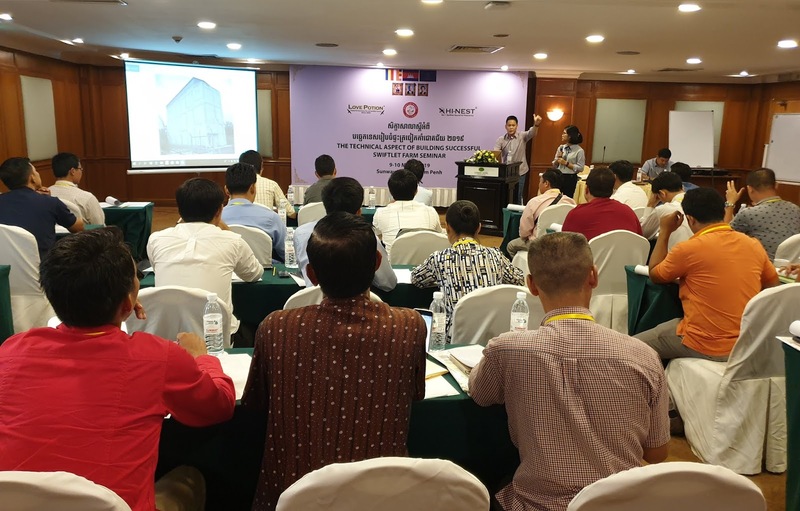 So what if you could build a cheap economical Swiftlet farm but it is built to fail? 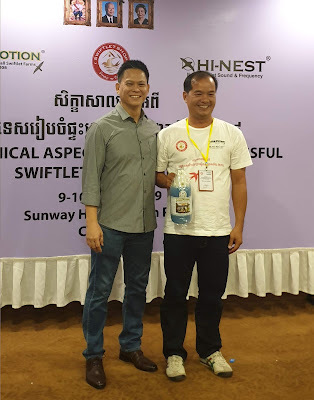 I had visited many failed Swiftlet farms in Sabah. 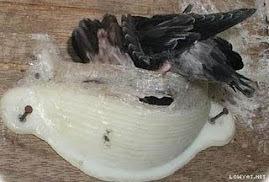 The way they built Swiftlet farms now in Sabah is worse than 30 years ago. I mean the technique, skill and knowledge. 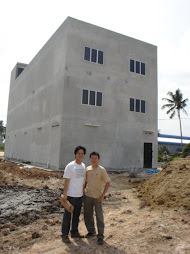 I believe the aim and objective was to build a building rather than a successful Swiftlet farm. It is not the builder fault. They had completed their tasks. They gave you what you paid for. You wanted a building they built one for you. You can't blame them because you are the one who had chosen them. 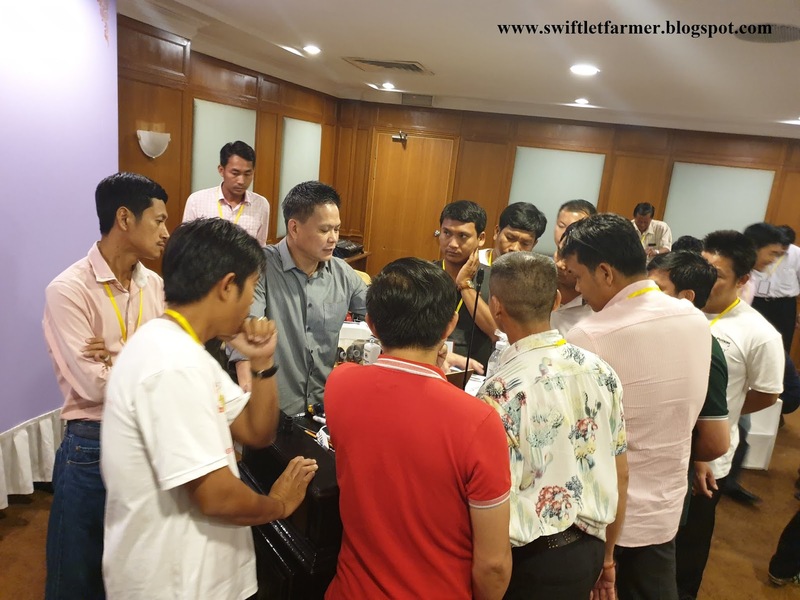 As I had mentioned before, again and again, building a successful Swiftlet farm has got nothing to do with pricing. Swiftlets don't care whether the building cost is cheap or expensive. Most importantly, it is how the internal environment being made and designed so that it is suitable for them to stay and build nests. Most people have forgotten this simple ideology. 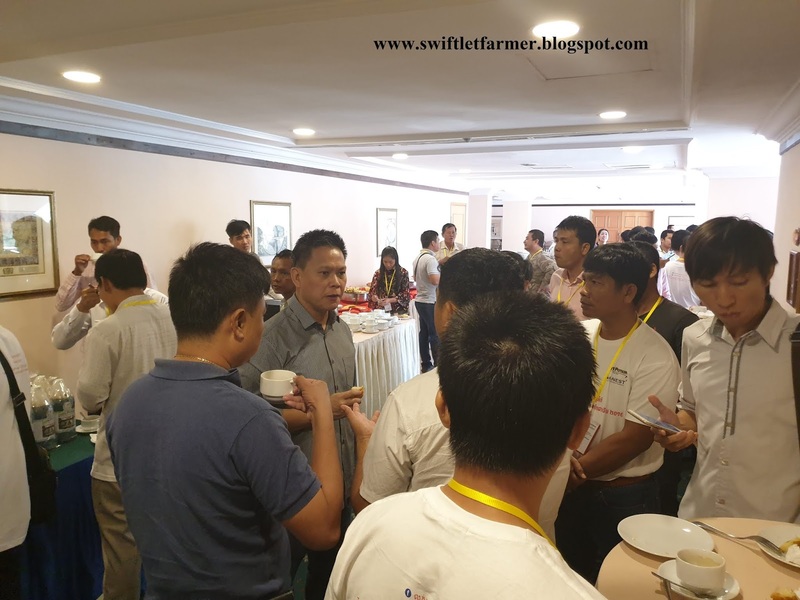 Now they are banking on who could build the fastest and cheapest Swiftlet farm. Let’s examine the problems of the failed Mini Swiftlet farm which many people still unable to observe and notice. From here you would know why Mini Swiftlet farm tends to have more problems. 1) I have got nothing against the Mini Swiftlet farm. 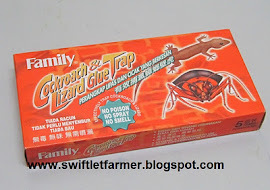 But, I do not support the idea of Mini Swiftlet farm because its size. 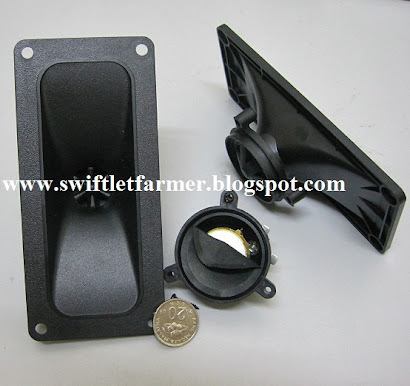 The Mini Swiftlet farm restricts the flying path and making bird's maneuvering difficult. 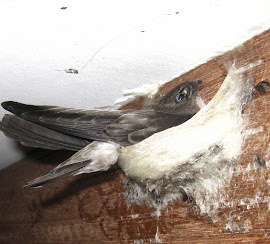 If Swiftlets can't fly in and out easily as a result they won't stay. 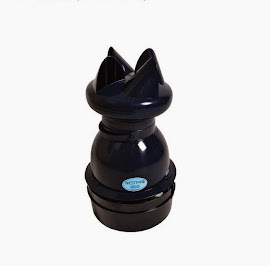 2) Because of its small size, controlling of lighting and air flow is restricted. We can't erect partitions to slow down the air flow as it will restrict the flying path. In other words you are creating problems as you are building it. 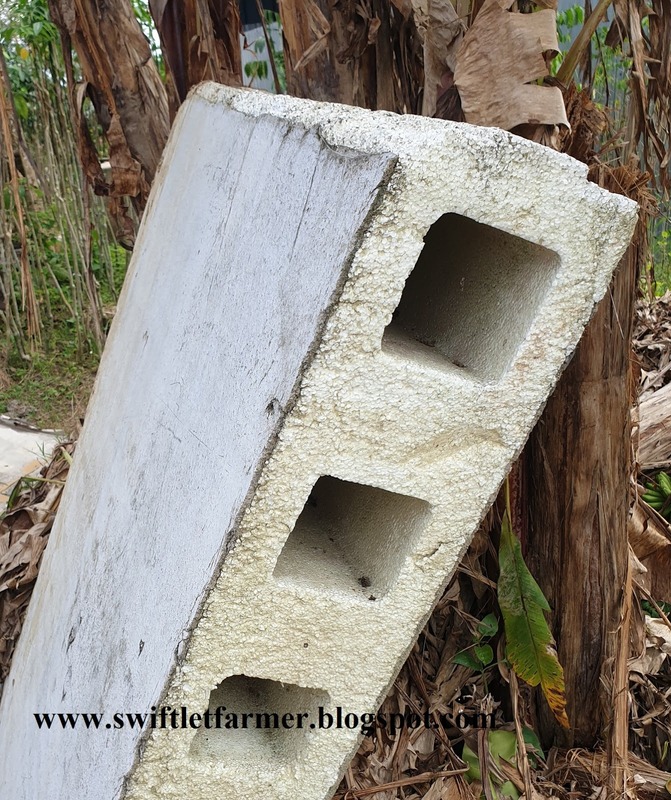 3) The materials used in this Swiftlet farm is Styrofoam impregnated with thin cellulose. 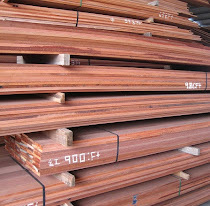 This material is often used in Europe, cold countries as insulation. It is too artificial. It doesn't adsorb water and there will be no vaporization process like the natural cave environment. Unlike clay bricks which adsorb moist and release them slowly to stabilize the humidity. I definitely won’t encourage the use of the Styrofoam impregnated with thin cellulose. For residential houses and industries use, yes. 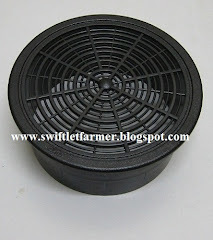 But not for Swiftlet farms use. 4) Secondly, the Styrofoam impregnated with thin cellulose absorbs sound and reducing the frequency rebounds. 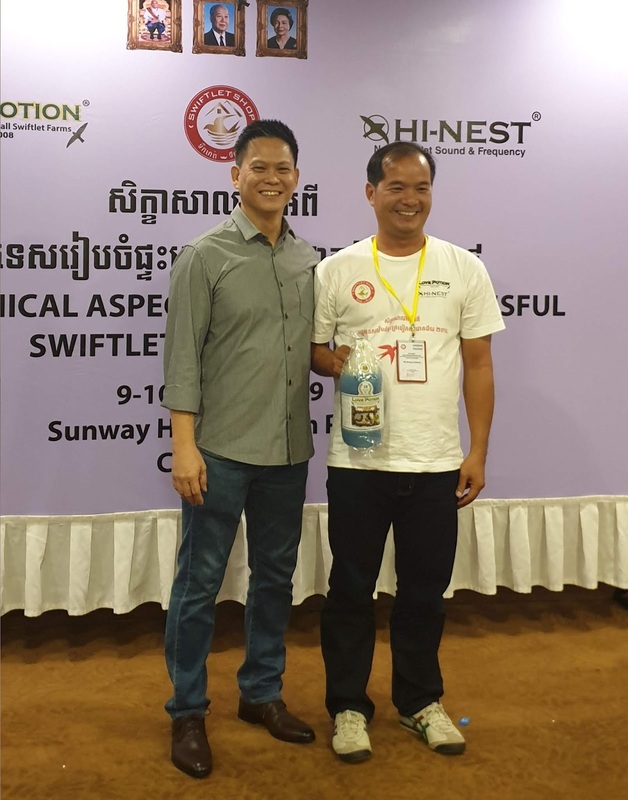 High frequency of Swiftlet sounds are absorbed into the wall making the Swiftlet sound less attractive. 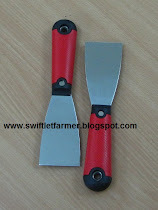 It reduces the effectiveness of the Swiftlets Sounds. 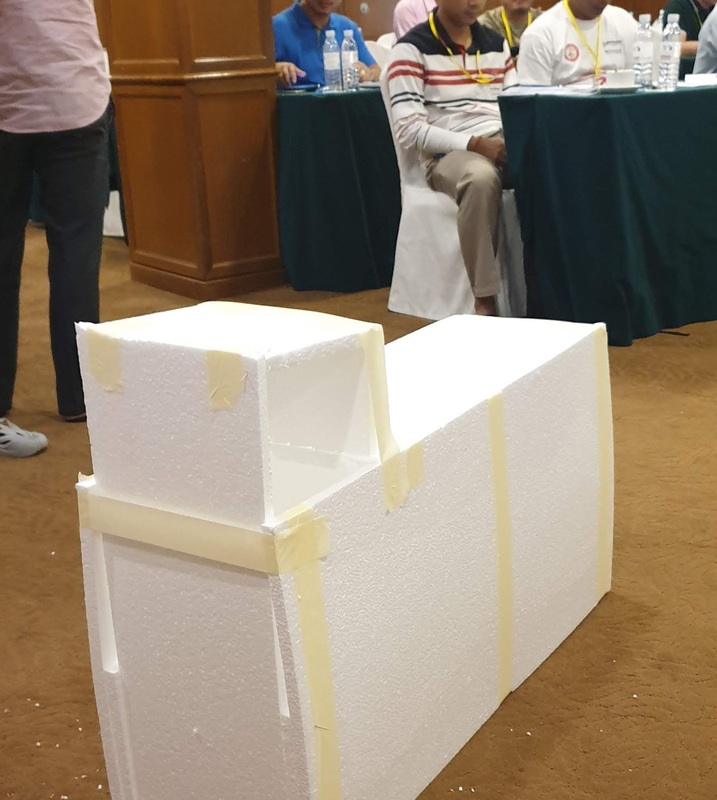 (In sound Industry, Styrofoam is used as material for sound proofing). 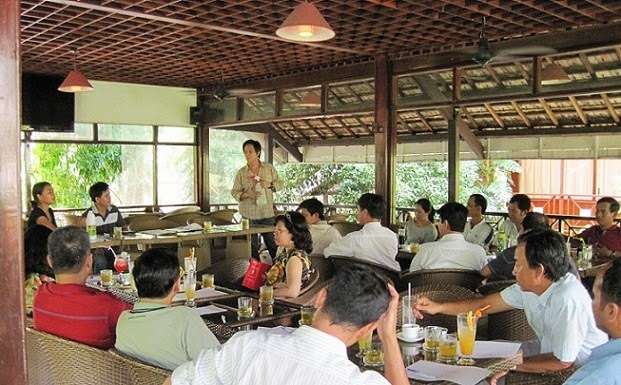 5) Through my visiting experiences, people in Sabah are prone to believe in myth rather than skill and technology. 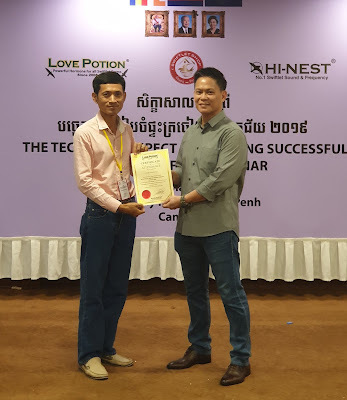 Like I had said, there is no magic in Swiftlet farming. 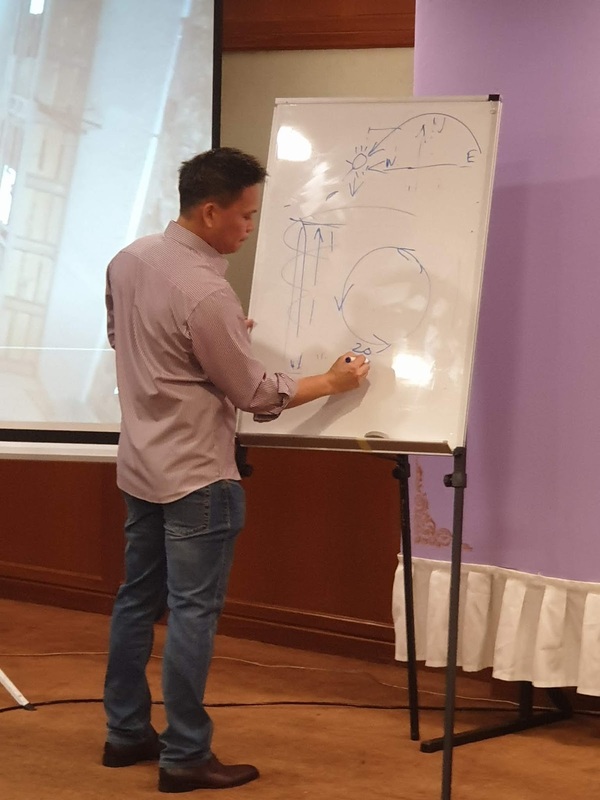 Go and learn the correct skill and learn the correct way you will be successful. This is also subjected to who you learned it from. Don't let the blind lead the blind. 6) There are 2 things we could observe from the way the Entrance hole is being built. A) The reason an Awning of 2 ft is installed on top of the Entrance hole is to prevent rain water from entering the farm. The floor of the small dog kennel is of Styrofoam impregnated cellulose and is jointed to each other. Unlike concrete which could hold water and is water proof. 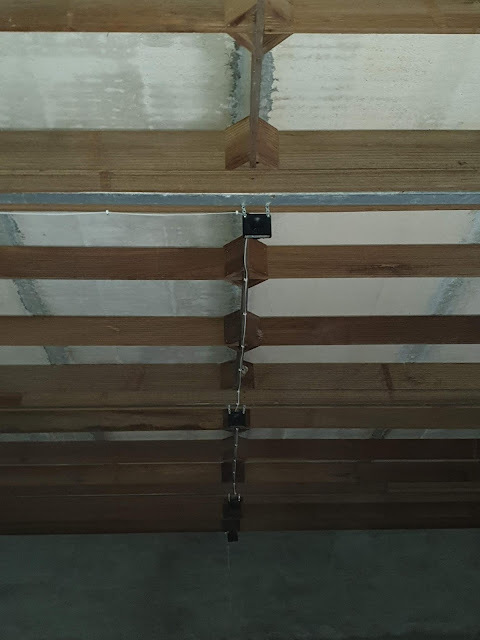 Any water entered through the Entrance hole will seep through the jointed gap and will flow down to the ceiling as a result all the planks will get wet. To prevent this, therefore an Awning was built (a very bad decision). 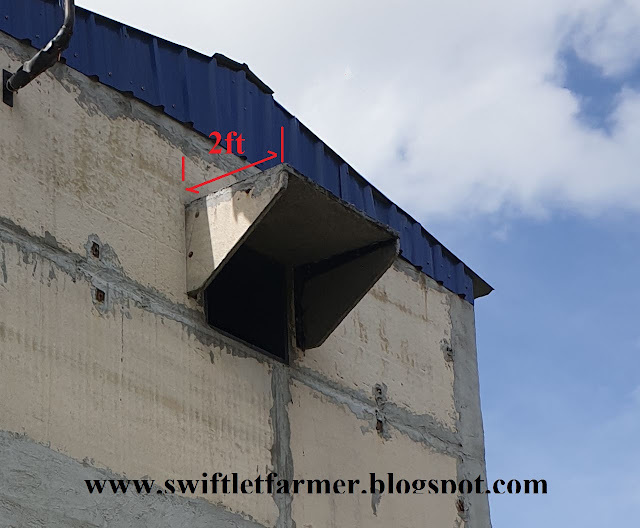 This forced Swiftlets to slow down and fly lower and leveled to a horizontal position before entering the farm. 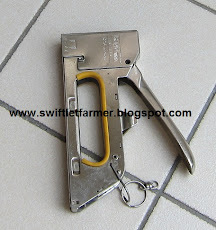 This prevented Swiftlets from diving into the farm with speed. As we know during home coming at 7.30pm most Swiftlets would prefer to dive into farms. Slowing them down would expose them to predators. As a result Swiftlet would avoid staying in this Swiftlet farm. B) The length of the Mini Swiftlets farm is short (the name says it all) making it easier for light from the Entrance hole to reach the nesting area making it too bright. To counter this problem they added a 2 ft Awning. If the farm was made longer or has partitions then the 2 ft Awning is not needed. So you could see clearly how problem arise from the Mini Swiftlets farms. As a result, reducing the size of the Entrance hole and adding a 2ft awning have done more harm than good. The person who built this Swiftlet farm should have known all these. 7) The Second Entrance hole is too small. 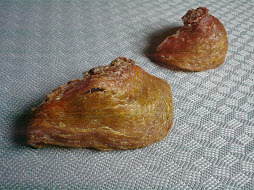 It is difficult for the Swiftlets to maneuver. Any form of restrictions that interfered with Bird's Runway will prevent them from staying in the Swiftlets farm. 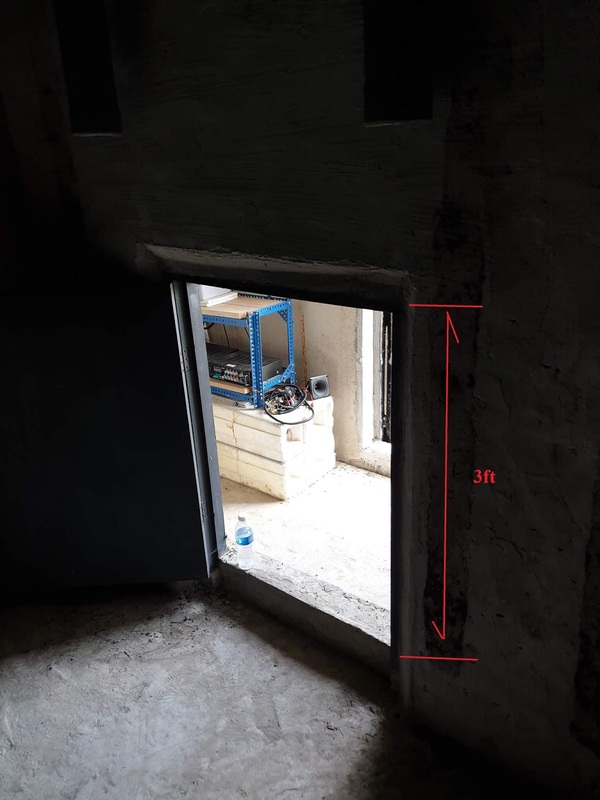 Why the Second entrance hole was built this small? The answer is "the builder is creating its own problem". 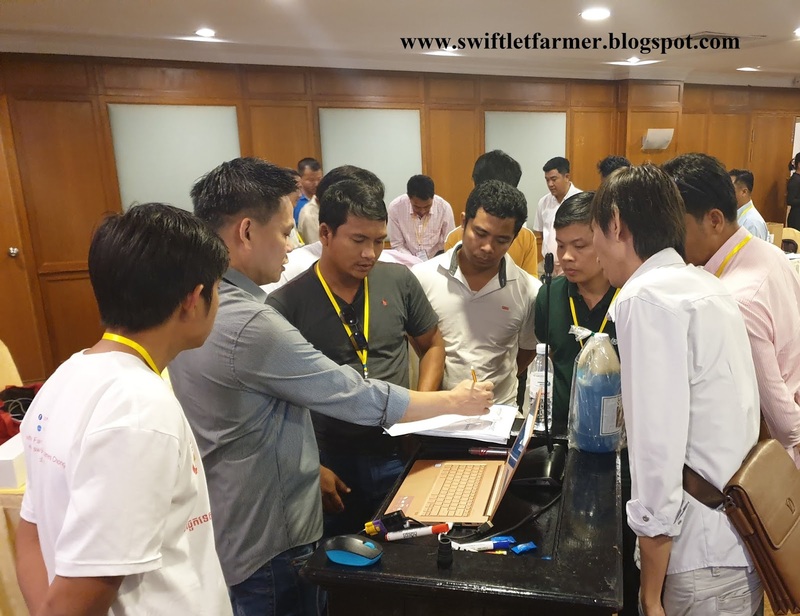 Mini Swiftlets farm space is limited. They can't create a big roving and big second entrance hole as it would take up the spaces and reducing the size of the nesting area. Secondly, the purpose of the small Second entrance hole is to reduce the light density. They didn't know the consequences from their actions otherwise they wouldn't have built it this way. Making it worst the Entrance hole is parallel to the Inter-hole. The glares could easily penetrate directly in to the nesting area and making it too bright. 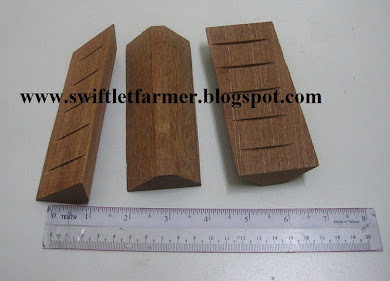 8) Since this is custom made Swiftlets farm from zero to a building, why the exit door is made 3ft height. Every time we enter the farm we have squat down. Unless this building has been there for years and we are converting it into a farm otherwise there is no reason to build a 3ft exit. The builder's skill and knowledge is questionable. 9) Tweeters in the middle and there are only few of them. 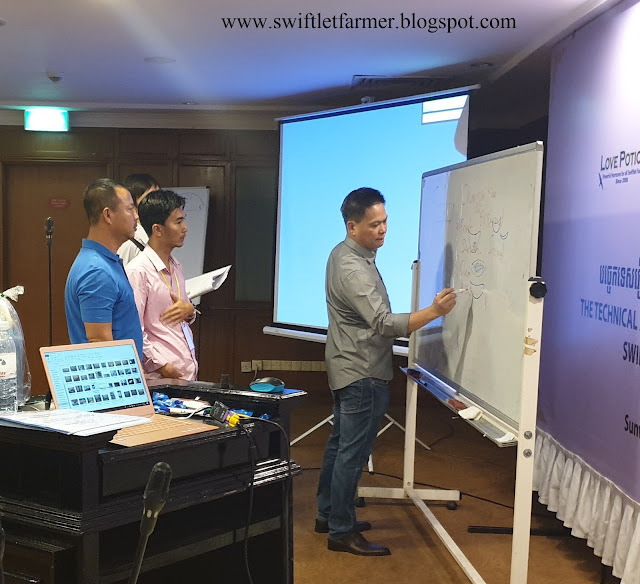 No.1 basic Swiftlet farming knowledge, Swiftlets don't fly in the middle. They fly in a circular motion 1-2 ft from the wall. That is why the very first nest in a new Swiftlet farm often built at corner at the edge of the farm. By knowing this more Tweeters should be installed at the side. 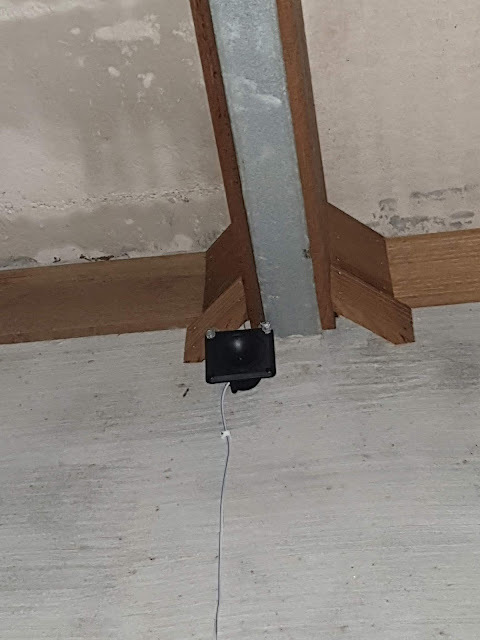 10) Tweeter should be placed under the corner boards so that the Swiftlets would build nests on top of the tweeters, not sideways from the corner board. To safe cost, they are squeezing the cost to the limit. Whether the farm is successful or not to them it is secondary. 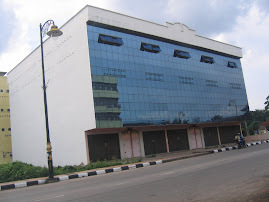 11) The structure of the building is of hollow steel. It looks clean and nice. 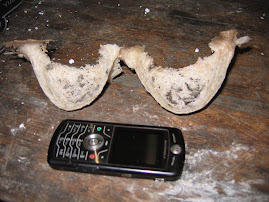 It will worn out soon as Swiftlet farm is always in high humidity (wet) . When the dropping mixed with water and moist it will corrode the hollow steel. 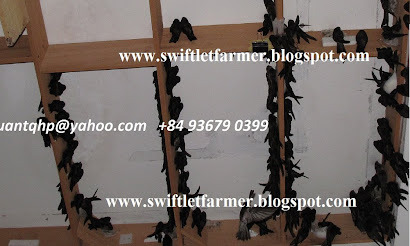 The life span of this type of Swiftlet farm is short. 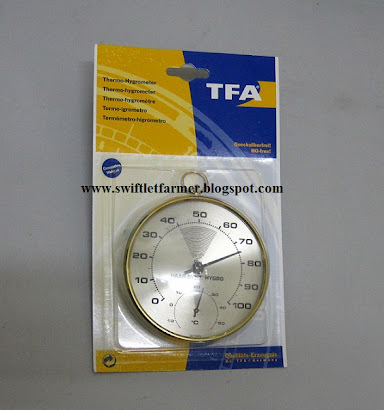 12) Small farms tend to have internal heat distribution problem. The smaller it is the more heat intensity concentrated on a small area compare to a bigger farm. In order to reduce the temperature they increased the number of Ventilation hole. Cross ventilation is a problem here. 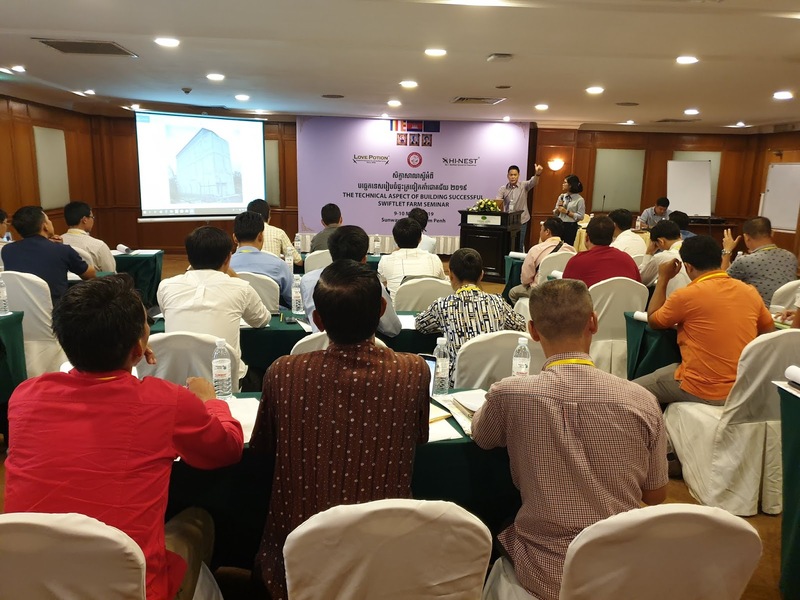 When hot and drought season come, hot air from outside could easily enter the farm through the Ventilation hole making the internal temperature unstable. There are too many Ventilation holes here. 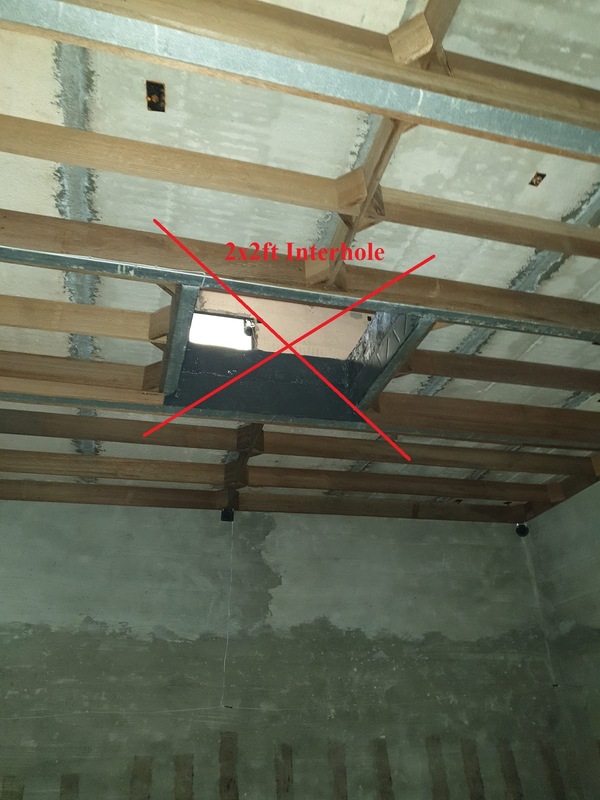 Often builders just follow what they saw and they do not understand the purpose of the Ventilation hole. 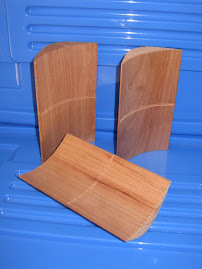 Often Ventilation hole has been misunderstood by many as a tool to cool down the internal. This is absolutely wrong perception. 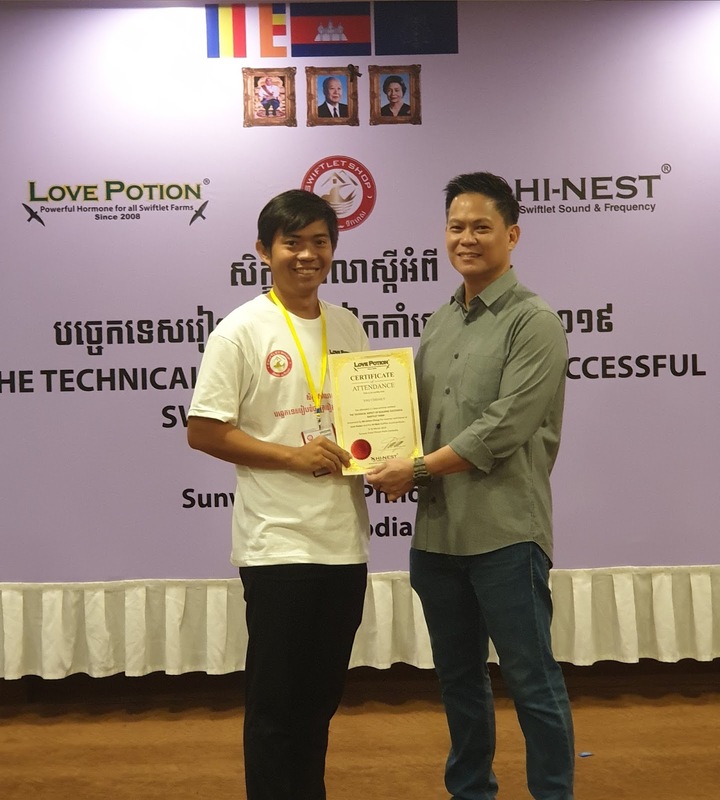 Some may argue that there are also Mini Swiftlet farms that are successful too. Yes I agree, but the percentage is small. When competition comes in the fittest will survive. I had already written about this in my previous articles. Back in the 80's and 90's people in the rural areas had converted their chicken and goat coops into Swiftlet farms and a few of them doing quite well. Eventually, when competition comes in the birds would have more choices to choose from. 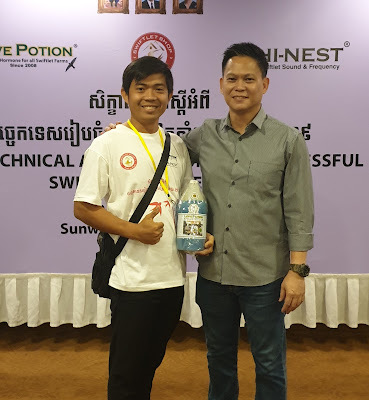 The better designed Swiftlet Farms and those that have better internal environment control will capture all Swiftlets, including young birds from successful Swiftlet farms. There are more problems that I have observed, if I were to write here it would take up at least another 10 pages. For those who have no passion for Swiftlet farming and only come in for the dollar sign they would fall asleep reading this....isn't this boring? 1) Redesign the whole internal. 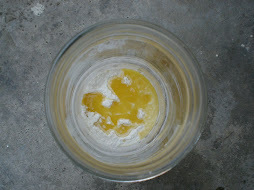 7) Hormone and Aroma management. Bear in mind having many Swiftlets come and play and stay is totally different from having many Swiftlets building nests. A customer of mine sent me this video of a Hi-Nest B52 Amplifier that he has been using for the past 4 years. He bought it in 2015 replacing 2 old malfunctioned amplifiers. 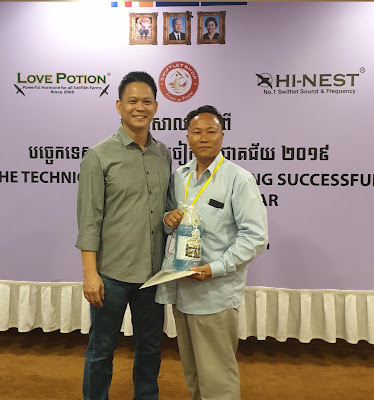 Ever since then, he had been using the Hi-Nest B52 Amplifier running non-stop 24/7 for 4 years and it is still producing good quality sound now. He only uses one Hi-Nest B52 Amplifier to play the Internal sound. He used to have 2 Amplifiers rotating them alternately 6 hour each session. This was the norm in the older days and in fact many still practicing it today. They just followed it without knowing the reason behind it. The older Amplifiers were not made for Swiftlet farming use. 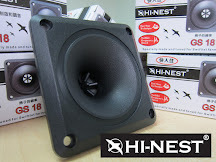 Most were Karaoke Hi-fi amplifier re-packed and re-branded for Swiftlet farm use. Nobody would design a Karaoke Hi-fi that could play more than 6 hour. (Tell me who could sing more that 6 hour non -stop). Therefore the only option to prevent the amplifier from over heating and burned is to shift them 6 hour each session. Whats surprised me was the place where he placed the Hi-Nest B52 Amplifier was dusty. It could be clearly seen that Hi-Nest B52 Amplifier is covered with thick dust. 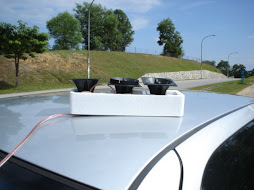 The Hi-Nest amplifier is tough and produces Swiftlet frequency sound. With details drawing. Secret exposed. 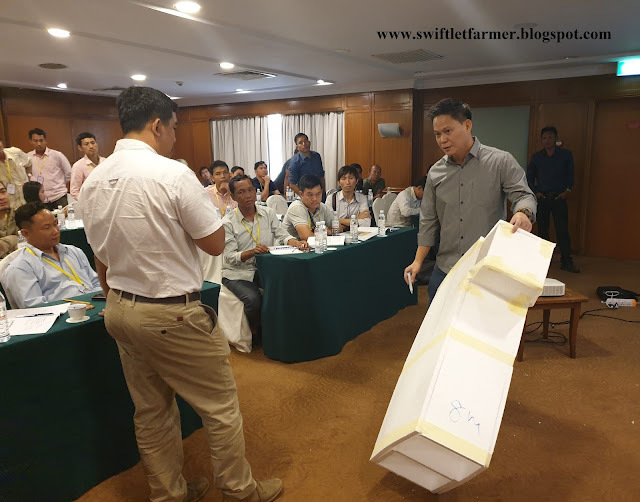 Explaining the flying path and how to design a good a Swiftlet farm. Showing the degree angle the Birds take to turn. Must take this into consideration when designing a Farm. 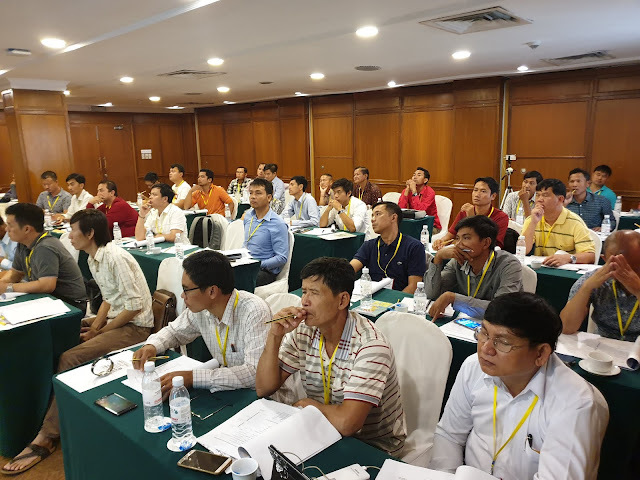 My Seminar entitled "The Technical Aspect of Building Successful Swiftlet Farm" received an overwhelmingly participants attendance beyond expectation. 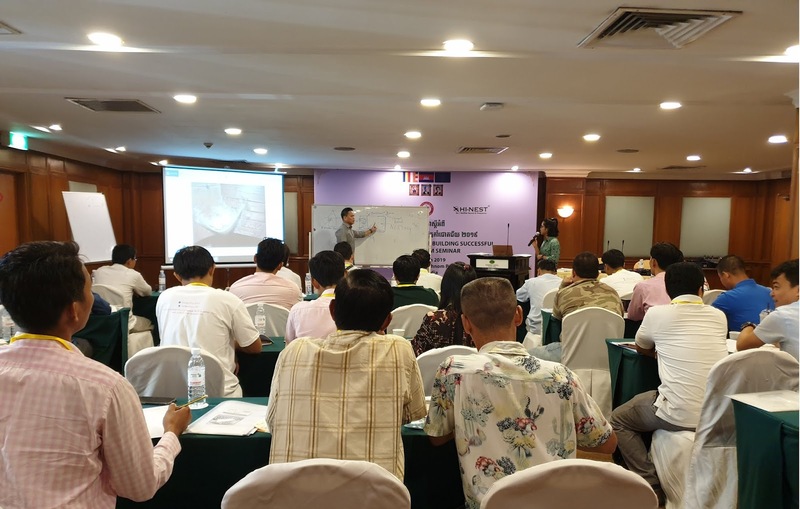 We had limited the number of participants so that we could pay more attention to every participant making sure they could absorb and understanding the techniques and skills that are taught in the Seminar. 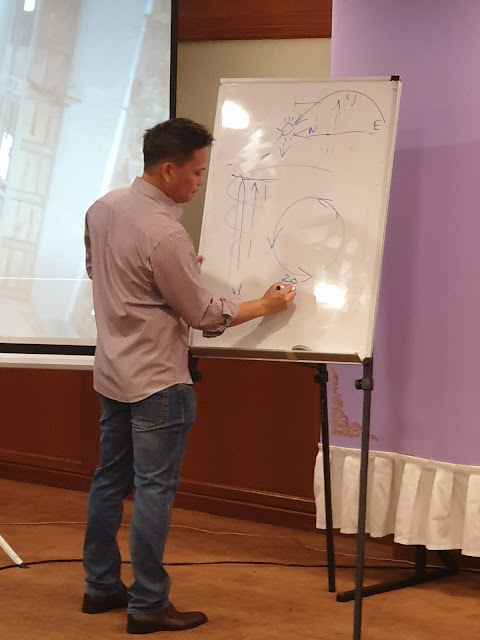 This Seminar is beyond basic. It teaches you more than basic. I wanted them to be able to apply the skills and techniques that they had learned from the two days seminar and apply them in designing and managing their future Swiftlet farms with success. Most Sifus don't teach you how to observe and they don't teach you how to think. We had changed all these. We teach critical thinking. 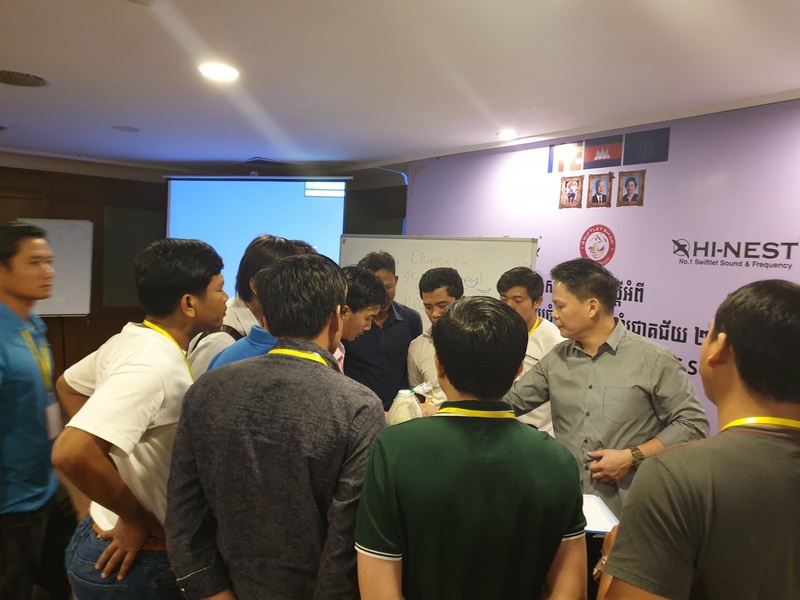 I taught them how to think, how to solve problems and how to observe changes and apply them in designing Swiftlet farms that are liked by Swiftlets. 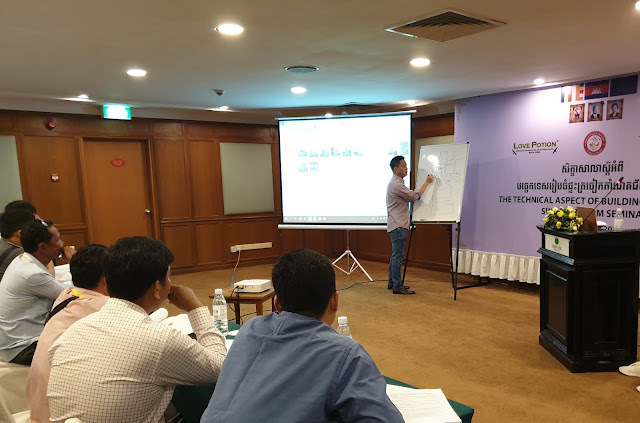 We explained in details with charts, pictures and videos, even with model mock up. 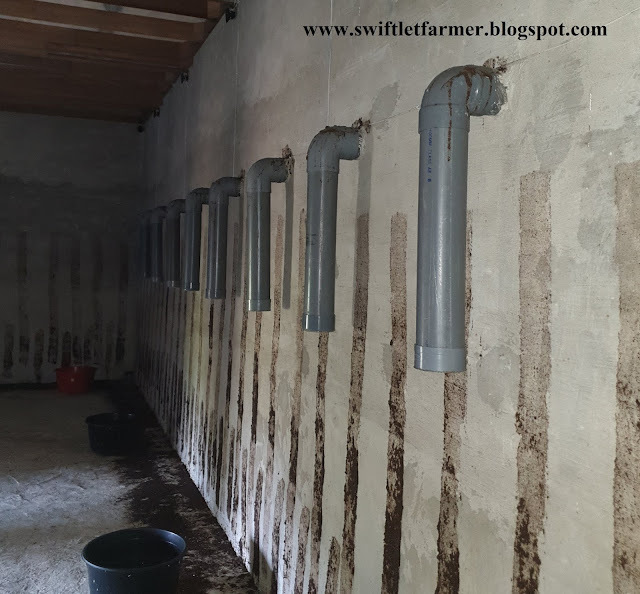 Most people would tell you that a Swiftlet farm needs to be at 27C and 90% Rh and so on. They expected you to follow it. But, they didn't explain why and what you should do to archive this and what are the underlying causes that affected this. 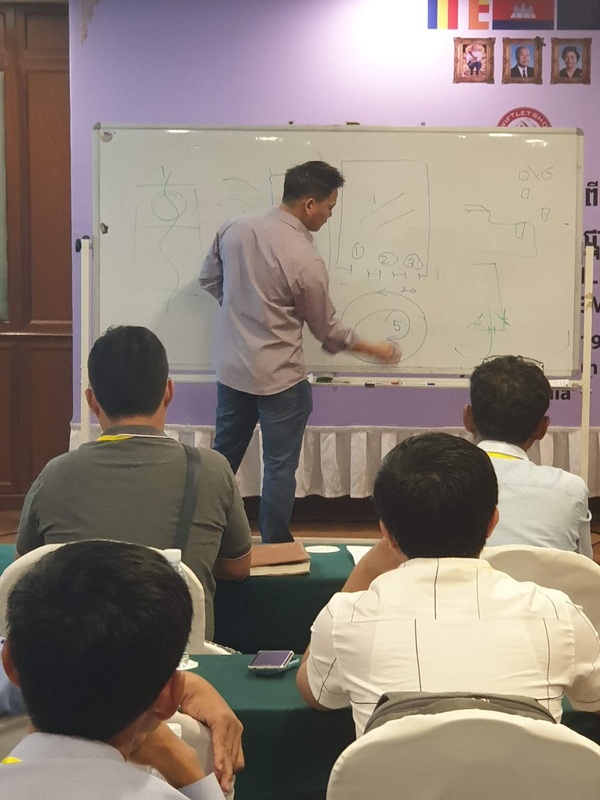 They didn't explain the correlation between these two factors and so on, and they expect you to build a successful farm. They would just ask you to install humidifiers and other gadgets. 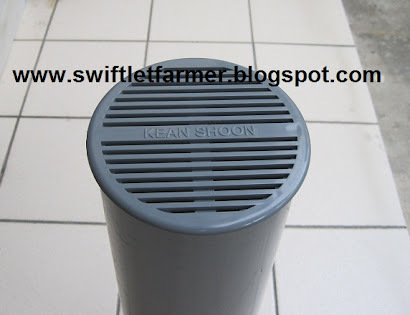 But, they didn't explain what's caused low humidity and the perimeter like position of the Swiftlet farm, vent-holes, building materials of the farm , the partitioning, size of the entrance hole to name a few, all of these directly or indirectly would affect the temperature and humidity in the Swiftlet farm. If you understand how all these work and how they are related to each other then you could counter any shortcomings that arise.
" The Runway of a Swiftlet farm." Why do we need Runway? How does the Runway affects the number of birds that stay in the Swiftlet farm. This Seminar teaches you to create and design your own Swiftlet farm and its runway rather than following or copying others. 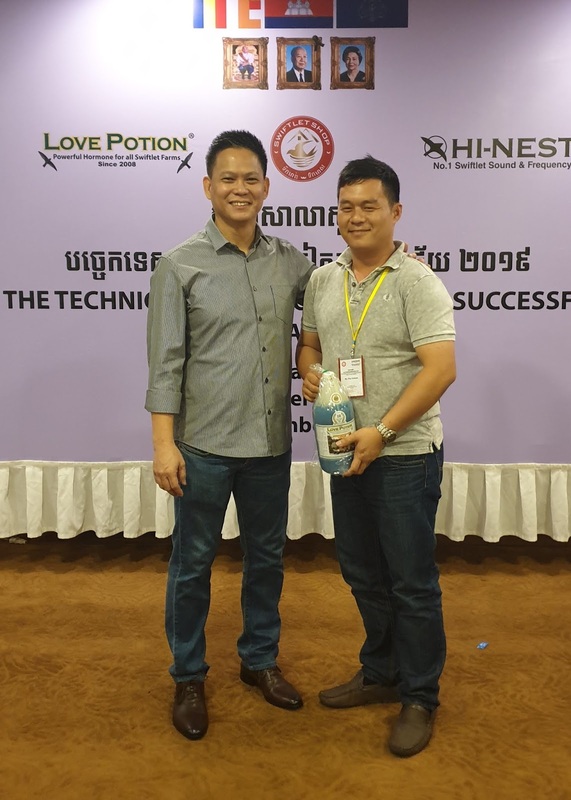 Success lies on how well you have designed the internal of your Swiftlet farm. Example, understanding of the Swiftlet sound. They would tell you this sound is good, that sound is good, but they didn't teach you how to identify good sound (perhaps they might not even know) and how to listen to them and understand each tune for every aspect. If you do not know how to interpret the chirping sounds then how would you know which sound is good for your Swiftlet farm. Above are just a small fractions of what I had taught in the two days Seminar.There are many more things and secrets we had shared with the participants during the Seminar. 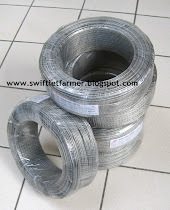 "The Technical Aspect of Building Successful Swiflet Farm". Explaining the internal design with Model mock up. The Light density is easily understood with mock up. Seeing is believing. 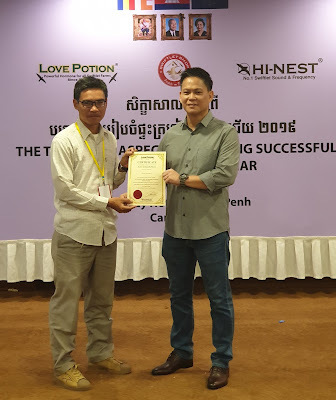 "LEARN THE CORRECT WAY THE FIRST TIME"
THE NEW PACKING OF LOVE POTION " Powerful Aroma Hormone" AVAILABLE NOW. Should we Stop the Billon Ringgit Industry?